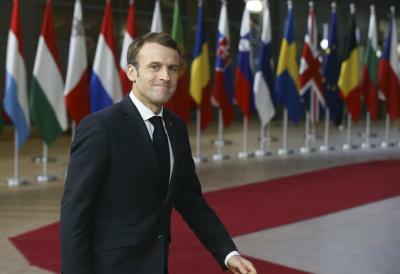 Paris, Nov 25 (IANS) French President Emmanuel Macron has lashed out at demonstrators who clashed with police in Paris during the latest protests sparked by rising fuel prices. He tweeted: "Shame on those who attacked officers," BBC reported. "There is no place for violence in the (French) Republic." More than 100,000 people took part in about 1,600 protests across France on Saturday, the Interior Ministry said. Most passed off peacefully except in the capital, where 8,000 demonstrators had gathered. There was chaos on the Champs-ElysÃ©es as police used tear gas and water cannon to disperse protesters. The demonstrations are part of a campaign that began a week ago. The protests initially focused on rise in fuel duty on diesel but later grew to reflect anger at rising living costs, particularly in rural areas, and other grievances against President Macron's policies. Five thousand police personnel had been deployed in Paris and metal barriers around the Champs-Ã‰lysÃ©es had been set up to stop protesters reaching key buildings. Some protesters tried to break through the police cordon. They lit fires, tore down street signs, erected barricades, pulled up paving stones and hurled them at the police while shouting anti-Macron slogans.